Learning How to Dance in the Rain ....: Its raining hair !!!!! Well it is a very quiet night here at home tonight. Granny and Grandpa flew back home today , C is at a friends for dinner after a day of fun and movies and B is at a work meeting. So A and I are holding the fort. I can hardly believe that on Thursday I am going for my next chemo cocktail - a strawberry daiquiri would go down a lot better!!! In any event as I said to a friend today I have to keep thinking about the big picture and not focus on the here and now too much! I have been feeling a bit flat this last week - I think the reality of starting the side effect road from the start again does not put a bounce in my step!! 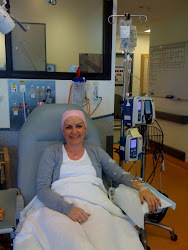 You just begin to feel you are poking your head up above the chemo haze and then its time to start again. My hair has been falling out for the last week and I am getting decidedly thin on top - I had contemplated shaving off the reminder but at the rate its falling by the time I get an appointment it will all be gone Im sure. I am worse than a moulting retriever - hair everywhere I go ! I have been twisting headscarves on my head , trying on hats etc - much to my family's delight - not. I have had comments such as - I think that looks like a tea cosy? You could be an old fashioned maid servant - and then some very quiet looks as I waft about in another head contraption. I am thinking bald may just be the way to go - will see - am awaiting a few scarves I have ordered - lets hope they look a bit better! I have been trying to use a bit of hair product to add volume to a rather thin head of hair - well that backfires as when I put the product through with my fingers - my hands are full of more hair yet again - kind of defeats the point!! It was off to the oncology department again today to give me the once over before Thursday - I had bloods taken etc to check if my blood cells are recovering suitably from the toxic onslaught! I have been prescribed some more drugs to help manage a couple of side effects I had trouble with - so the scene is set. Abs came with me and then we did another pre chemo shop and a few other jobs . Was nice to spend a bit of quality time together ! I have pretty much just been house bound this past fortnight - so was nice to see a bit of life outside but once again I am feeling exhausted. I am amazed how little it takes for tiredness to set in ! Tomorrow will be the usual whirl around and attempt at getting all in place for the next couple of weeks - the girls start back to school on Monday so I will have to have uniforms etc ready to go!! I am going to miss having them at home with me - they are great company. "Never measure the height of a mountain until you have reached the top . Then you will see how low it was " Dag Hammarskjold.